Today on The Heinemann Podcast: Amy Ludwig VanDerwater says poems can do everything and allow us to become who we are. Amy says there is magic in poetry and that magic translates into teaching. She says once we can get past the idea that poems are in their own little word, they open up a world of possibilities in the classroom. Her hope is we can infuse everything with poetry. Amy doesn't just wish this though, she’s written for us a way to actually do it, in her latest book, Poems Are Teachers: How Studying Poetry Strengthens Writing in All Genres. Amy’s energy about poetry is infectious and that comes through in our conversation. Later on in our chat, Amy shares a few selections of poems from her book. We started our conversation on how poems can open up learning. 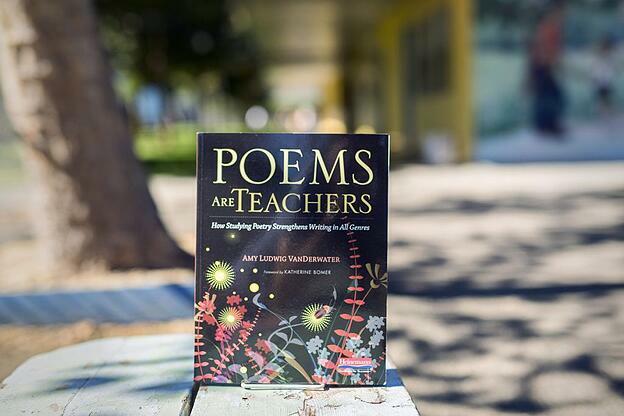 If you’d like to read a sample chapter, a series of blogs from the book or connect with Amy checkout Poems Are Teachers: How Studying Poetry Strengthens Writing in All Genres. Be sure to follow Amy on Twitter @AmyLVpoemfarm and be sure to visit her website https://www.amyludwigvanderwater.com where you can learn about Amy’s new children’s book: Read! Read! Read! See below for a transcript of our podcast. Please note the transcripts for the poems Amy reads have been omitted for copyright. To read the poems, please review Poems Are Teachers: How Studying Poetry Strengthens Writing in All Genres. Amy: Well, one think that I have found for years and years and years is that no matter who the child is, no matter how old the child is, no matter how strong of a writer he or she perceives him or herself to be, they all love poetry. Sometimes they as children don't have a chance to explore poetry, or they are only writing acrostics or really, really funny poems or poems that follow a super, super specific form, like I am, I am, I am, I am, I am. What a poems can do is it can just open a door I think to, wow, I have some freedom here, and I can write about anything. I could write about something I believe deeply or something that really happened to me, or I could explore my silly side. Then, once you're there, once students are writing lots of poems, you say, you know, this thing you did in a poem, like you used repetition here, you could use that in your information piece too. You can bring the same techniques and little suitcase from one genre to the other. I think one of the things that is true in a lot of places in writing instruction is that we compartmentalize. We say, this is narrative, and this is opinion, and this is information, and this is poetry which we're going to ignore. Really, the things that writers do, the techniques that writers use, they do thread right through no matter what genre the writing. I think poetry is a way to introduce different techniques, and then to see, how do poets do it? How do information writers do it? How do narrative writers do it, and all that. Brett: Why do poems get misunderstood in school? I mean, how can we bring them in in a way so that they're better understood and so that they're used more? Amy: That's a really interesting question. I think about this a lot, because I think most people, people either feel like, "I love poetry completely. It's an important part of my life." Or, "I'm sort of nervous about poetry. I don't feel like I get it. Maybe I had an experience where I was forced to analyze, and I didn't feel like I analyzed properly, or I was reprimanded for not figuring out what the poet really meant." There's that, but then there's also a sense sometimes of, poetry has to be a certain format, so we have to give children a structure. It's almost like a close passage like, I'll give you the first part of every line. Sometimes I think people either feel nervous about poetry, or sometimes people feel like poems have to be funny. I love funny poems as much as the next person, but they're just one slice of the poetry pie. Sometimes if someone does have a perception that poems are supposed to be funny and they're supposed to crack kids up, and that they maybe don't explore the whole range of human experience, which is is why I love poetry because whoever you are in that moment, there's a poem to match it. I just had in the past two weeks a little girl come up to me at a book festival, was so exited to come to the book festival. She was waiting at my table to hand me a poem she wrote about the book festival. A teacher who sent me a poem because her husband's deploying to Iraq in two weeks with the repeated line saying, "I am built for this." She had told me she's a struggling writer, but she just wrote this poem after this workshop. Then, a friend who posted on Facebook a poem on her son's birthday, but her son had died several years ago of a Heroin overdose. Poems explore ... you can go anywhere with a poem, but I think if you think poems are just funny, then what happens is children think poems are just funny, then maybe we wouldn't see them as useful tools for teaching language, sort of like a cute extra. Sometimes poems get that cute ... Maybe administrators or some people might say, "We don't have time for that. Poetry isn't in the Common Core Standard, so we can't." Meanwhile, it's in every culture maybe other than ours. A deeply held treasure. Brett: How does poetry help students in terms of becoming writers and especially in exploring other genres? Amy: Well, poems are short. Right? Mostly, usually you can see a poems on one page, so you can just see there's the poem. It's right on one page. You can read it out loud in one sitting. Everybody can read it out loud together, in chorus, whatnot. Then, right at that moment it jumps off of you. There's a simile here, or wow, look at the way the poet began and ended the poem the same way, or whatnot. That's right in front of you. You don't have to flip 30 pages or read a novel or a whole huge text. It's crystal clear. I think what poetry does ... I don't know who said this, but it's just most, it's like concentrated orange juice. It's the most crystallized genre, so therefore in order to write poetry, strong poetry, you have to be the best of all with words because you don't get many. Because poems are short, you can look at them on one page, you can understand a technique easily, and then once you understand it, you can take it along to something else. Brett: Length, as you mentioned, it makes it more accessible too. Amy: It's also really helpful because you can memorize a poem. Not that everybody has to memorize a million poems, but through repeated readings even if you don't memorize the whole poem, certain lines stay inside of you and then those rhythms become a part of you, and then they end up coming out in other places where you don't even expect them to come. Brett: Walk through a little bit about how some of the lessons are in the book. Describe some of the lessons in the book and then some of the accompanying poems with them. Amy: Sure. I've been teaching writing for 19 years, and I've been writing poetry for children for, I don't know, 15 or something. This is really the coming together. This is like the Venn diagram, little slice where they come together, those two things. Because what I have noticed is that in my life my prose is stronger because of my poem writing. Right? I have to use fewer words, so then I try to do the same thing. I try to write leaner. Because I've been teaching writing for a long time. We talk a lot about the qualities of strong writing. We talk about the ways that different people describe what makes strong writing. Writers have to do these same things across genre. We have to pick ideas. We have to organize our writing or structure it in a particular way. We have to use language within whatever structure it is. Little snips here or there, descriptive language, metaphor, whatnot. Then, we have to begin. We have to have an enticing beginning and an ending that makes the reader feel satisfied and we have to title. These are things that no matter what we're writing, we have to do all those things. Therefore, this book is organized that way. Right? There's a chapter on finding ideas, and then there's a chapter ... Then, each chapter has several explorations I'm calling them, that because you could teach them as they are, or you could just take another poem and use it with or interpret it a different way. Each lesson has several of these explorations that include a few of the same parts. One, a poem by a contemporary poet. These are poets who are writing today for children. Some of the poems are brand new for this book. Some are already in other books. For example, Kwame Alexander's poem in this book. He was very generous to let us use a poem from The Crossover. Some of these poems teacher will know, be familiar with, students will, and some are not. Each of those poems by these contemporary poets stands on one page alone. Thank you, Heinemann for doing that. It stands on one page alone, so you can pass it out and children can have a copy. Then, after that, I asked each poet to describe whatever that technique is. Let's say the technique is writers can find ideas by looking at a piece of art, or a writer can write a poem using or any other genre using a structure from nature like the seasons or colors of a rainbow. Then, I asked each poet to describe, why would you do this, or how do you use this technique? How do you use art to inspire you? How do you use repetition? How do you use simile? Can you tell a little bit about that? There's a little italicized paragraph from each poet about their own because one of the things that I learned from Katie Wood Ray, who edited this book, is that it's very important for children to understand they're people behind pieces of writing. There's an author. There's a human being behind this poem, and that person alive right now and they can tell you about it, so here's a little paragraph with that author, that poet, telling you how they really did it. That I think is a really important piece. There's that. Then, there's a little bit about me, talking about that technique and how you might use, see it in other genres. Then, after that part there are two poems by students of varying grades between first and eighth grade. Two student poems. Every single exploration in the book is set up exactly the same way. Poem by an adult, words from this poet, listen to Amy talk about it, and then two poems by students. You could use this as a poetry unit, but also what I think would be kind of cool if I were in the classroom again would be to say I'm going to choose one of these explorations each week of the school year or every other week or something, and introduce students to this writing technique or this writing strategy through poetry. Here learn this with this poem. Here it is, the poem's short. We can all do this right now. Then, this week let's as we read other genes, as we read in our independent reading as we read other things together, let's see how other writers use the same technique. Over the course of the year then students and teachers, and you know. I learned all this myself just through writing, would say, gosh, yeah, I do see how this thing I learned in this poem. I see it over here, and I see it over here. It's not just in that little corner of poetry land, it's everyplace. Do you want to hear a couple? Brett: Yes, please. That'd be great. Amy: All right. I'll read you a couple. It's hard to pick, you can see. I want to read you all of them, but I won't. Okay. This is a poem. One of the sections in the book that I failed to mention before is writers also choose a perspective and point of view when we write. If I want to write a poem about my cat or a story about my cat, I write either about my cat in my own voice, I can write as my cat. I can write about someone else talking about my ... There are lots of ways in, you know. This is a lesson about writing in the first person singular. This is a poem in first person singular, which is not the most important thing about it. The most important thing about it is it's a beautiful poem. It happens to also be in first person singular, and that's important I think that we don't send a message to students that, I'm reading you this poem because it's in the first person singular. I'm reading you this poem because this is a really beautiful poem, first, and then later let's talk about this first person singular thing. The other thing that's interesting is each of the poems use a lot of interesting techniques. We could pull many things to talk about in this poem, but we'll just do that. Editor's note: text of poems have been omitted from transcript. The following section has been edited around the readings. Brett: There's so many prompts there. Amy: ... and it brings you somewhere. You could do it everyday and you could open a different door to somewhere else, which is interesting. Amy: The poems aren't just ... we're not just playing with techniques here. This is who she is. You become more of who you are when you have opportunities to write poems about who you are. Brett: Again, to come back to that length, there's so much going on in that in just a small amount of space. There's just so much. Amy: Right. That's the magic I think. Once we can get pass the idea that a poem is sort of in its own little world, then it opens up a whole world of possibility for how to bring poems and just infuse everything with poetry.